My current Rankings which I posted in December are already outdated. Good restaurants continue to close and chefs continue to leave. That does not make me happy. Miami will miss Michelle Bernstein's Cena by Michy and Alex Chang at the Vagabond. Fortunately, there have been several new restaurant openings over the past few months to fill the void and some are truly great. 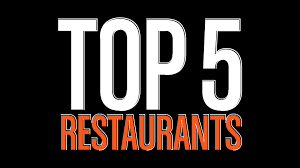 Instead of doing my usual Top 20 or Top 15, I've decided to shine the light on the Five Best Restaurants in town now. As many of you know, I use an algorithm I co-created with an M.I.T. professor. It's not perfect but it helps me identify the best of the best. By now you should know the drill. This list is chef and food driven. But beverage/wine programs, service, management, ambiance, value and overall experience all play significant roles. I take this very seriously because I know how hard chefs and restaurants work to serve us great food and provide us with perfect dining experiences. But it's done as a guide to assist you with dining choices and to pay tribute to the chefs and restaurants that are doing outstanding jobs.